It always saddens me a little when a writer sends me an overly formatted Word doc to turn into an ebook or print-on-demand. It’s not that I have to clean it up–I can strip and flip the messiest files in less than an hour. What bugs me is how much thought and effort the writer wasted on utterly useless manuscript styling. Example of a Word doc that has been overstyled. The majority of writers I work with use Word. The vast majority have no idea how to use Word for their own benefit. I understand. 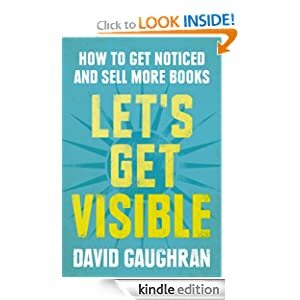 I was a fiction writer for over two decades and even though I have been using computers and a variety of word processing programs since the late ’80s, it wasn’t until I started learning book production that I figured out how those programs worked. Why would I? All I needed was a printed manuscript in standard format to mail to my editor. Word processors made that easy. Now I produce books for digital and print, and those old ways of “thinking print” make the writer’s job harder. Especially indie writer/publishers who might be doing it all alone or working with contractor editors and proofreaders and formatters. Since it would take a full book–or volumes–to explain how word processors work, I’m going to urge you all to take what I tell you in this post and play around in your word processor. I will be talking about MS Word, but much of what I show you will apply to almost any word processor. Example of a manuscript that uses NONE of the above. (Left) Basic manuscript formatting; (Right) Overly formatted manuscript. See that backward P-looking icon I’ve circled? That’s the “show” feature. Toggle it on and you can see paragraph returns, spaces, tabs and a few other formatting features. With the basic formatting on the left, all I had to do was apply one style (Normal) to the entire manuscript, then apply heading styles to the chapters and sections, and done. To style an entire manuscript takes minutes this way. The manuscript on the right is an entirely different matter. To get it looking the way I want would take hours, if not days, manually lining everything up, trying to get it to look the way I want it. Worse, I have to remember what I’ve done so I can remain consistent throughout. When I’m done, I still have to scroll endlessly through the entire document to find whatever I might need to find. And what about what is happening behind the scenes? MS Word uses html to control all those features. If you’re printing a document, the only true concern you have is making sure your fonts print properly. If you’re turning your work into an ebook, all that hard work (and useless effort) works against you. The html in the basic Word doc and how it displays in Firefox. The overly formatted file in html and how it displays in Firefox. Every version of Word has a style sheets feature. If you’re using 2010, you’ll find them in the “Home” toolbar. Word comes with a huge variety of pre-built style sheets. You can use them as-is or modify them. You can create your own style sheets. The most useful styles for the fiction writer are: Normal, Heading 1, Heading 2. Normal: apply to the body of your text. Set your paragraph indents, line spacing, and font. Never worry about spacing, margins and indents again. Heading 1 & 2: apply to titles, chapter heads or sections. Bonus: Word will automatically list your headings in the navigation window. No more scrolling through a long document to find a specific chapter or section. 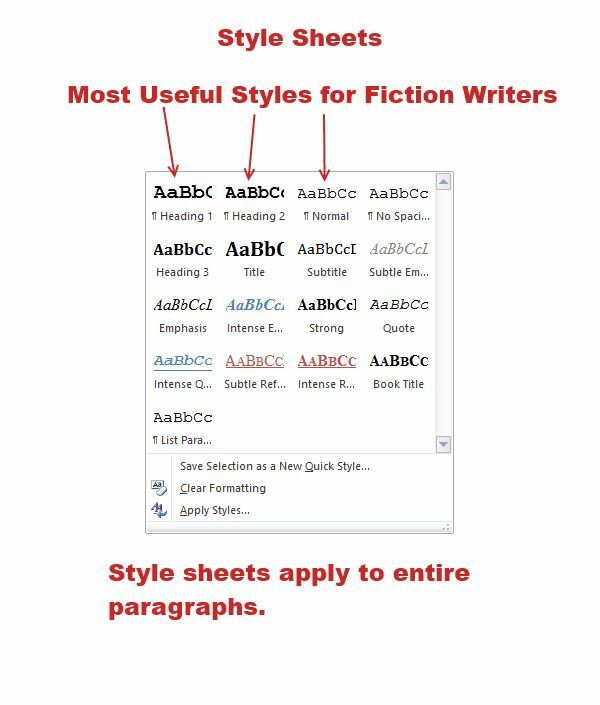 Another Bonus: Ebook conversion programs recognize heading styles. Some, like Calibre, will automatically build a table of contents for you based on headings 1 & 2. Emphasis: Remember, styles apply to paragraphs. “Emphasis” is italics. If your entire paragraph is italicized, use “emphasis”. Custom style–“Center”: Instead of clicking on the icon for centering, create a style sheet. Makes life easy. Poetry: For poetry, quotes, lyrics, anything you want with different margins and font style. 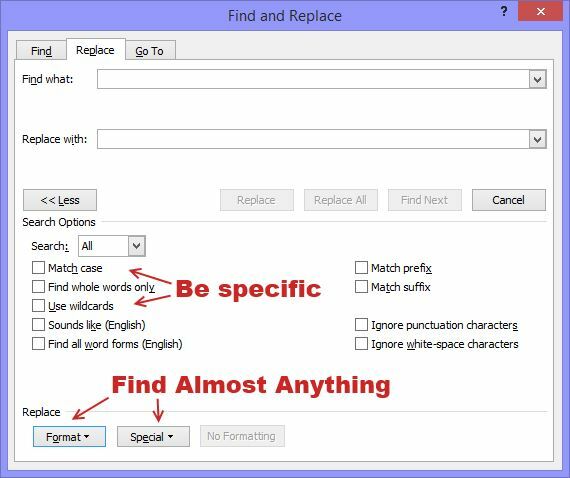 This is the most useful and the most underused tool in MS Word. You can use it to not only find words, you can find special characters, styles, highlighting, and special formatting (such as italics or bold). Click on the dropdown menus and you can look for anything that appears. ^& (caret ampersand): Stands for a string of text. Say I want to tag my italics. I would leave the Find box blank, but ask it to search for italics. In the Replace box I’d type -STARTI-^&-ENDI-, do a Replace All and Word will wrap all my italicized text in tags. ^t : Tab. Working on a document in which you or someone else used tabs and want to kill them all? Type ^t in the Find box, leave the Replace box blank, and do a Replace all. Done. * (asterisk): A string of text. Use as a ‘wild card’ when you’re restoring your special formatting. Say I want to restore my italics. In the Find box type -STARTI-*-ENDI-, click the ‘wild card’ box, and leave the Replace box blank but ask it to replace text with italics. Do a Replace All and all your tagged text is italicized. Then use Find/Replace to get rid of the tags. Forsake print view and get used to web view while you work. This view is flexible (flow text) and enables you to easily display multiple screens and compare text while you work. You can adjust the width of your screen, too, and not lose chunks of text or reduce the image size in order to see everything. Because I use a variety of programs, and I dislike intensely losing formatting such as italics or trying to remember where I want a block of offset text, I tag my formatting. Now, because Word is html-based, you do NOT want to use html tags in your text. It’s okay if you’re outputting a file to a text editor, but if you’re going to a program that is html-based such as Scrivener or InDesign, or if you intend to bring the text back (you’re ‘nuking’ it, according to Smashword’s style guide), then those html tags are going to seriously mess things up. My tags are arbitrary. I’ve come up with them because they are unique and easy to search for; they don’t show up in text (normally). Feel free to use mine if you want or come up with something that makes sense to you to use. IMPORTANT TO REMEMBER: Special formatting such as italics or bolding require OPEN and CLOSE tags. That’s it. Simple, no? 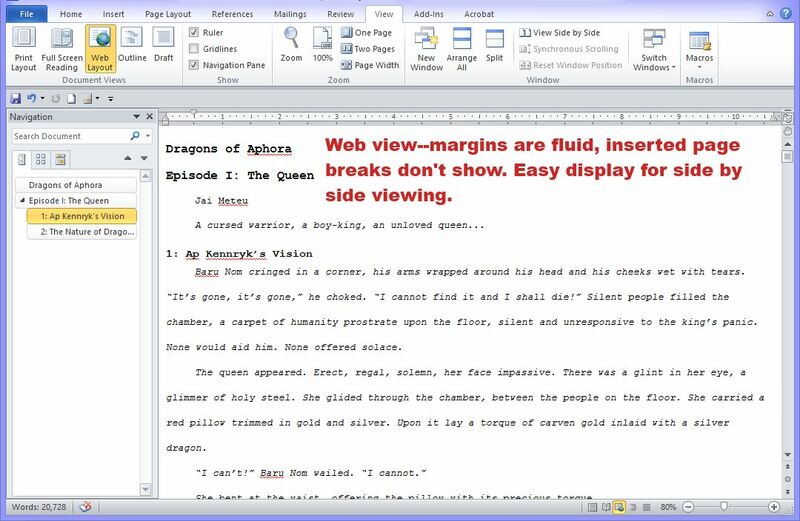 This is MS Word in the digital age, a writing tool you can make work for you instead of against you. This entry was posted in Adventures in Self Publishing, Formatting in Word and tagged how to tag special formattin, html in Word, overformatting Word docs, save as your files, special formatting, style sheets, web view in Word, Word for digital publishing. Bookmark the permalink. Okay, this I get, Printing it up! Thanks sweetie! IT DOESN’T MATTER A RAT’S PATOOT WHAT YOUR WORKING DOCUMENT/SOURCE FILE LOOKS LIKE. This, this, this, this, this! I was fortunate to have learned this early on. Since, I’ve heard conversion horror stories from folks, and didn’t understand why it was such a struggle until I saw a person’s hyper-formatted Word doc. Simplicity is key. Knowledge is critical. MS Word is good for creating print documents (not great, but good). For producing digital docs, it can be a nightmare. It’s just too too much and there is always the temptation factor of WISIWYG, which doesn’t apply at ALL, but for writers in the throes of composition, that’s exactly how it seems. I just sent a link for this to a FB Group with 5,500 indie authors. I hope some of them read it. I really really hope all of the authors I format for read it. Fantastic, Jaye! You’re great at demystifying things. Thank you ! Great information I wish I knew 40,000 words ago… I have my work cut out for me now…. I’m writing non-fiction so I may need a couple of style sheets but right now my work is a formatting disaster!!! Non-fiction can be tricky to format for ebooks, but far from impossible. –Titles, subtitles, sections, subsections. Just use the heading styles. Personally, I would never format a nonfiction ebook in Word. Too many opportunities to seriously mess things up. Do not ever save a word document as an HTML file. There is so much crap it attaches, it’s not even funny. Inline CSS is your friend. Far more than Word’s “Save as” command. I’m one who writes in Scrivener. What I’d love to find is an easy way to convert my Scrivener document into Word before sending off to my formatter (and preferably in a version that’s easy for me to read AND easy for the formatter to manipulate.) Anyone have suggestions for a resource? Using the Compile feature on Scrivener seems to create a mess, so I end up doing a cut-and-paste job that currently takes me nearly an hour and still leaves in muck I know the formatter has to fix. It’s been a while since I’ve used Scrivener (and I don’t have it loaded on my current computer, so I’m working from memory and you’ll have to double-check what I tell you). But here goes. I believe you can compile your documents into a text (.txt) file. If this is so, then first tag your special formatting (italics, bold, underlining) and tag your headings and page breaks and scenebreaks. You can use the find/replace function and do Replace All, so this won’t take much time. Use html neutral tags as I suggest in the post. Once you’ve compiled the text file, open it in any text editor (such as Notepad or Wordpad). Then select it all and copy/paste it into Word. Restore your special formatting and you will have a relatively clean doc ready to send to your formatter. Wow…thank you! Saving all of this. These are great tips that every writer should know to avoid wasting time making useless formats in their texts. Tips, hints and dark secrets of Word revealed in this excellent post. What a great post! A big thank you to JM Manus! I’m keeping this one close by so I can use it next time I’m trying to format my document. I didn’t know Word could do it this way. I wish I knew that on my previous project. Saw this via Passive Guy, thanks so much; this is super useful! I’ve been using justification, and that’s the only thing I feel weird not doing. Is this the new norm (or always been & I’d just missed it?)? If you’re used to the display, use it to compose. When you’re done and you’re ready to do something with the file, change it to align left. 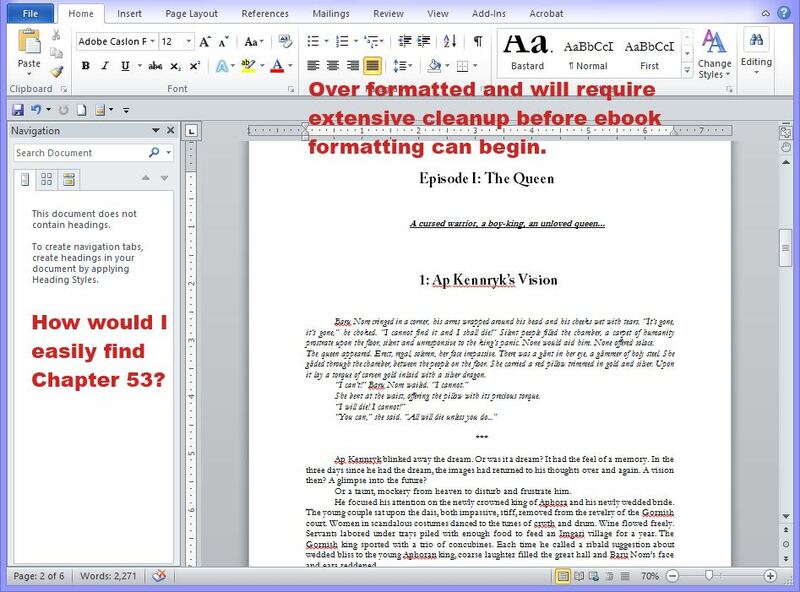 If you are using Word to format an ebook, justification can break it. I am not sure why, but it can affect the user preference controls and prevent the reader from changing the line spacing and/or margins. I’m trying out web view not, more interesting stuff! I’m using OpenOffice, and all this seems to be working there also. And pros and cons I should be aware of, re the two applications? Thanks Jaye. I’m not familiar with OpenOffice, but all html based word processing programs work in similar ways. The bells and whistles change, but the basics are similar and fairly interactive. If you keep it simple, focus on the words, and don’t bother trying to make it pretty, you’ll do fine. The toughest thing for a writer to grasp (and I include myself in this group) is that what you SEE is not what you GET. It takes time to make a clear distinction between text for composition and formatting for specific purposes such as ebooks. It’s the stuff you can’t see that makes a dog’s breakfast out of your work. 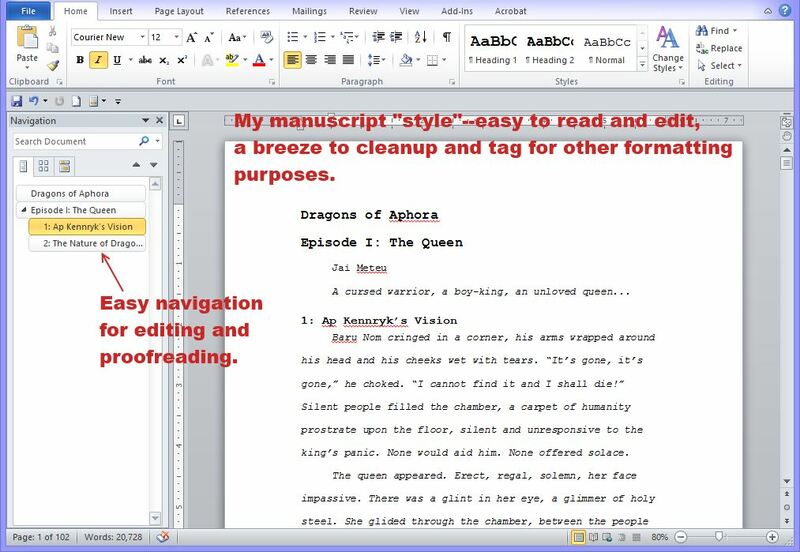 Any input for making MS Word work better for me and my ebooks is always welcomed. Word users, take heed. Such awesome tips for people who use Word! Thanks so much! Hi Mpax, this is where style sheets and Save As come in handy. When I’m composing, I prefer double spaced, Courier (really old school). I have a style set up already for my preferences. To do anything with it, I do a Save As, make a new version and apply a different set of styles. Makes life easy. Life is so much easier when you take the time to prep with style sheets. This is a great guide and had a few hints even I didn’t know I could use. I use Find/Replace every time I edit, but the useful search terms section opened my eyes to even better ways to use the system. 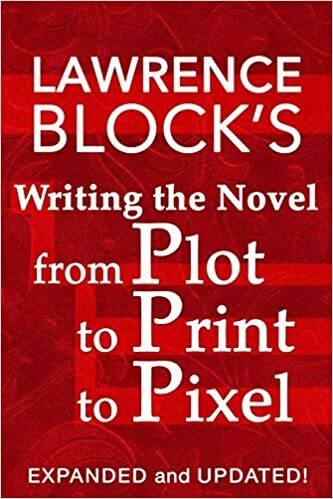 Writers take note, this will save you a bunch of time when you have to format for a publisher or self-publishing avenues. Saving this one! 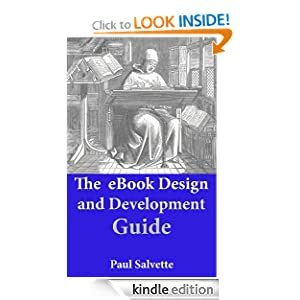 I use Open Office (I stopped using Word when Microsoft stopped giving it away for free with Windows) to write in and Calibre for conversion into e-book format. While I agree with just about everything you’ve said here, I am confused by your comment that page breaks should not be used. What do you use instead? Hi Misha. I should have clarified that. Page breaks aren’t necessary during composition. When the text is ready for formatting, THEN figure out where page breaks should go. It’s not that page breaks are bad in and of themselves. It’s that they are unnecessary. One of the things I hope writers can learn is that, with Word, What You See is NOT What You Get. If a writer uses inserted breaks to help them keep track while working, fine. But I see documents where writers use long strings of hard returns and go through convolutions with their text to create page breaks that look good on the computer screen. It’s extra work that wastes a writer’s time and it means extra work down the road to clean out. Far easier for everyone concerned to just quit using page breaks altogether. NOW, once you’re ready to do something with the text, that’s when you consider the page breaks. If I am formatting a doc for Smashwords (the ONLY instance where I will use WORD for ebooks) I set up the style sheet to insert a page break before every Heading 1 occurrence. If I need a break elsewhere, I insert it with the page or section break command. Okay, so Calibre will convert a .docx file to EPUB, but a .doc file is NOT supported. Interesting. So if you have a .doc file, you will need to use a program such as MobiPocket creator to convert your .doc file into a .prc file. Then convert that into your desired ebook formats. Jaye, I believe I can save a docx copy in OpenOffice. I’ve stayed with doc files to send to Smashwords. I’ll see if I can save to docx and try to convert from that. Thanks! I save documents in Open Office’s .odt format. Calibre works very well with that. If I am sending a document to a Word user, I send it in .rtf format. I have given up trying to get Open Office to save a file in .doc or docx–it ends up being a mess. Usually, when writing, I use one file per chapter. Catskinner’s Book, for example, I saved as CB01.odt through CB24.odt. Then, to convert, I added all of the files into one document (CBfull.odt) with a page break at the end of each chapter, added in a table of contents with links to each chapter (which, in my opinion, is the trickiest part of the whole process, but very necessary with e-books). Then I simply convert the full document using Calibre. I’ll review the file afterwords by loading it onto my Kindle, but so far it’s worked every time. Ahh, from the odt format, I’ll try that too; thanks so much you guys! 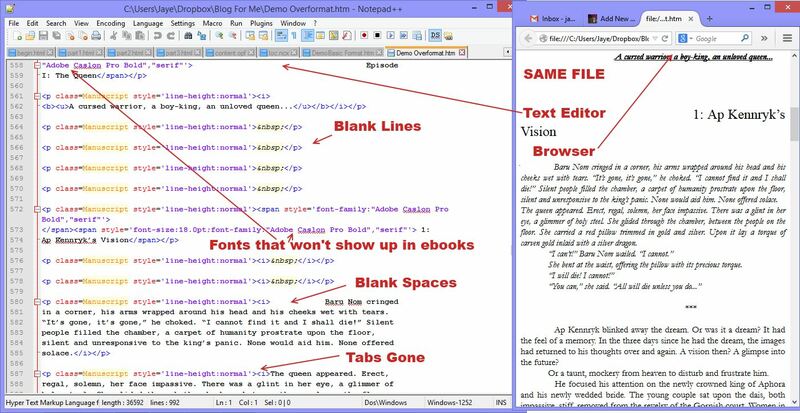 Editing in Word made easy. Anyone who writes in Word should learn to use the program to make their formatting process easier.